Access: The trail begins at the Hill Creek bridge, about half way between the Crane Lake and Hill Lake trailheads on the Three Lakes Trail. From Petersburg, drive south on Mitkof Highway for 20 miles, then turn left onto the Three Lakes Loop Road (#6235). The Three Lakes Trail trailheads are along the Loop Road. (See Three Lakes Trail listing.) 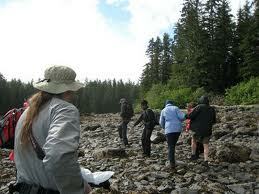 You can also reach the trail from saltwater about 0.25 mile north of Ideal Cove in Frederick Sound. Description: From the Hill Creek bridge, the trail descends gradually through muskeg and timber to the beach north of Ideal Cove. The trail parallels Hill Creek for most of its length and parts of it are muddy and hard to follow. None of the trail is boardwalk. The beach at the end of the trail offers views of Frederick Sound and the mainland. History: Hunters and anglers hiking to the three lakes from Ideal Cove originally referred to them as the Ideal Lakes. In the 1930’s, District Ranger J.M. Wyckoff named the lakes after the Sandhill Cranes that frequent the area. The Forest Service built the first trail to access the lakes in 1938. The trail started near Ideal Cove and skirted the northeast shores of the lakes. Later that same year, a crew cleared the original Three Lakes Trail, built the shelter at Shelter Lake, and built docks and rafts at Hill, Shelter, and Sand Lakes. The Forest Service maintained this trail until the early 1970’s when logging road #6235 was built. The new road made access to the three lakes area by automobile possible and the Ideal Cove Trail fell out of use. Today the Forest Service maintains the trail at a primitive level for more ambitious hikers.